56. A number like 4256, 755 or 61 that can be said without context and is immediately understood by all baseball fans. The number, of course, represents Joe DiMaggio’s 56-game hitting streak during the summer of 1941, one of the most incredible batting achievements in history. “The Streak” began on May 15, 1941, with the Yankees struggling at 14-14. Facing the Chicago White Sox, DiMaggio went 1-for-4 against Eddie Smith. Joltin’ Joe then hit safely in 18 more consecutive games before anyone thought to mention the fact in print. From that point on, the pressure mounted as DiMaggio hit safely game after game. He even got himself a hit in the Midsummer Classic, and then pick up where he left off following the All-Star break. When The Streak finally came to an end on July 17, DiMaggio had maintained a .408 average and tallied 91 hits, 16 doubles, 4 triples and 15 home runs. The Yankees, who had been 5½ games out of first when The Streak began, now had a record of 55-27 and held a comfortable 6-game lead in the A.L. pennant. Amazingly, upon going hitless to end The Streak, DiMaggio started a new one the very next game and hit in 16 straight. 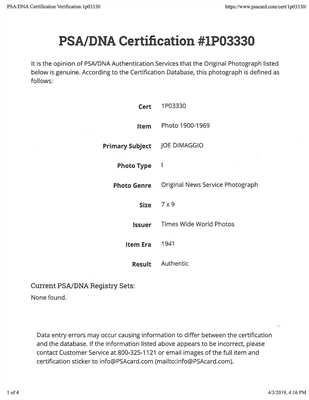 During The Streak, DiMaggio received three orders of a dozen 36-inch, 35-oz. Rudy York Y4 model bats. 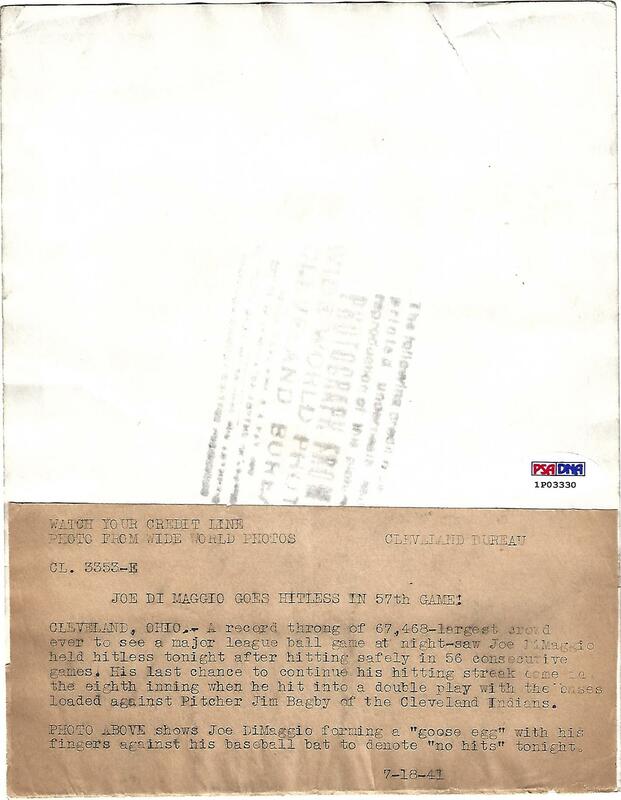 Of the three orders placed on 4/24/41, 7/1/41 and 7/3/41, only one was shipped with a flaw in the bats center brand stamp – a downward tilt of the “125” with the “1” being a fainter strike than the other two numbers. This offered bat, displaying that flaw, identifies it as being from that particular Streak-era order. 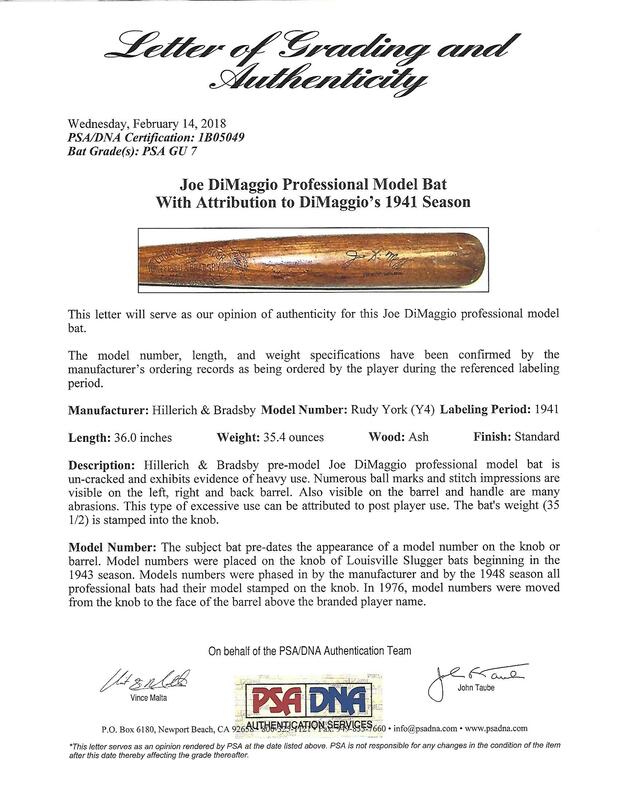 This, coupled with the special treatment on its surface, identifies this bat as being used either during DiMaggio’s MLB-record 56-game hitting streak and/or during the remainder of his MVP and World Championship 1941 season. 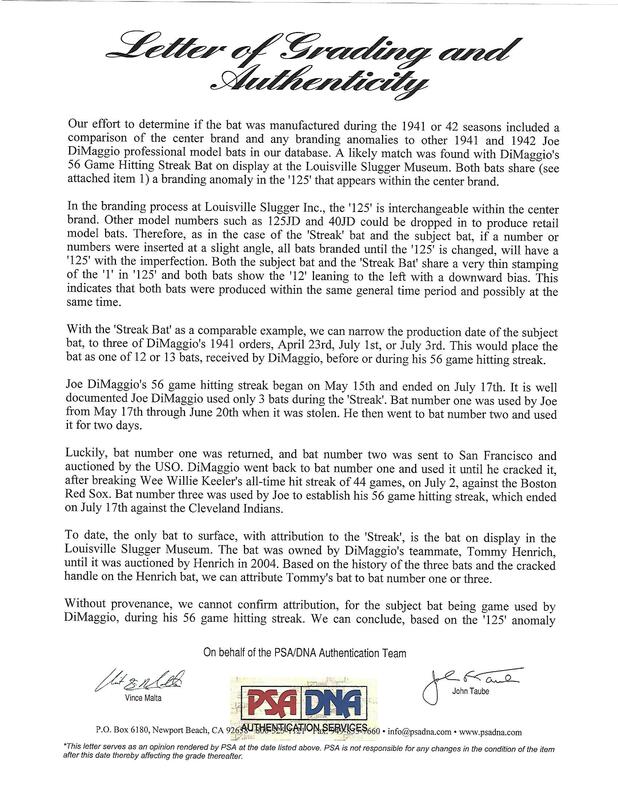 Of the legendary trio of bats DiMaggio claims to have used exclusively during The Streak, only one is currently identified. The bat, gifted to teammate Tommy Henrich after The Streak ended, resides in the Louisville Slugger Museum. 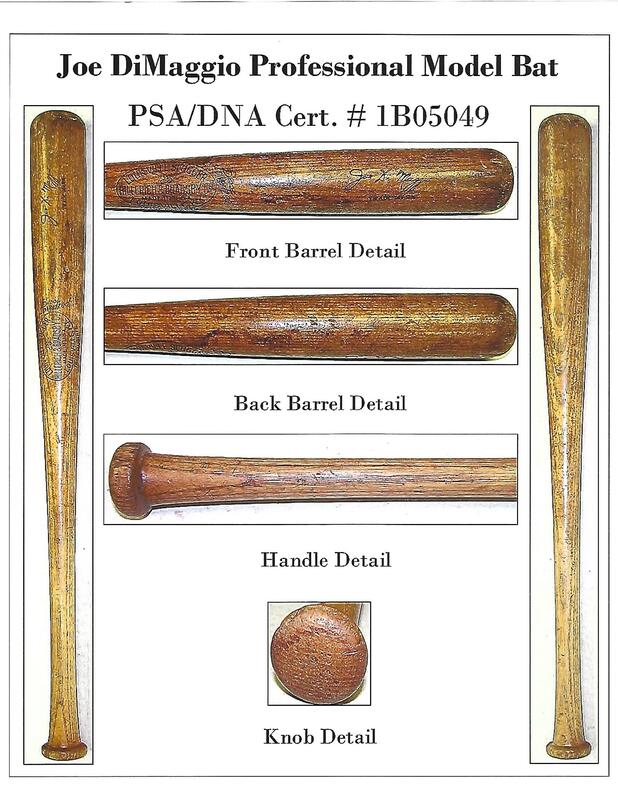 The center brand flaw visible on that bat is identifies it as being from the same single order that our offered bat originated from. The Hillerich & Bradsby Y4 model bat is un-cracked and shows great game use. There are many ball marks and abrasions visible on the left, right and back barrel, in particular above and between the centerboard and signature stamps. The bat’s weight of 35.4 ounces has been stamped into the knob and the special DiMaggio olive oil-resin treatment has given this bat its distinctive dark and streaked appearance. 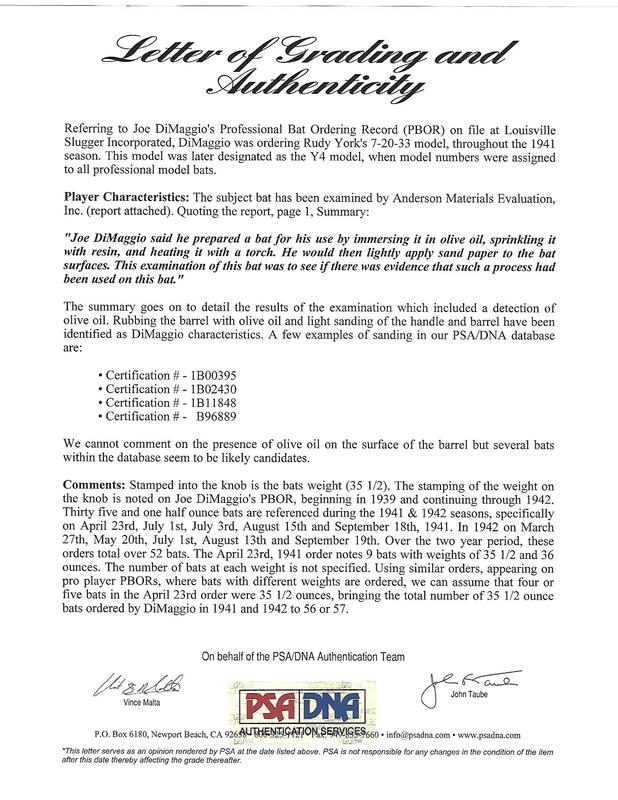 The following quote from DiMaggio within a 21-page scientific analysis document give rise to the likelihood that this is one of the three missing Streak bats. "I could order a dozen bats. They would all look alike, same size, same weight. But there's always one that feels different. That's the one I'd work on. I would dip it in olive oil. I'd sprinkle it with resin. I'd put a small flame to it. And when it was good and dry, I'd file it down with sandpaper. It would be hard and smooth and black. This was my bread and butter bat." An incredible artifact from one of the greatest single-season offensive achievements by any player in the history of the game. 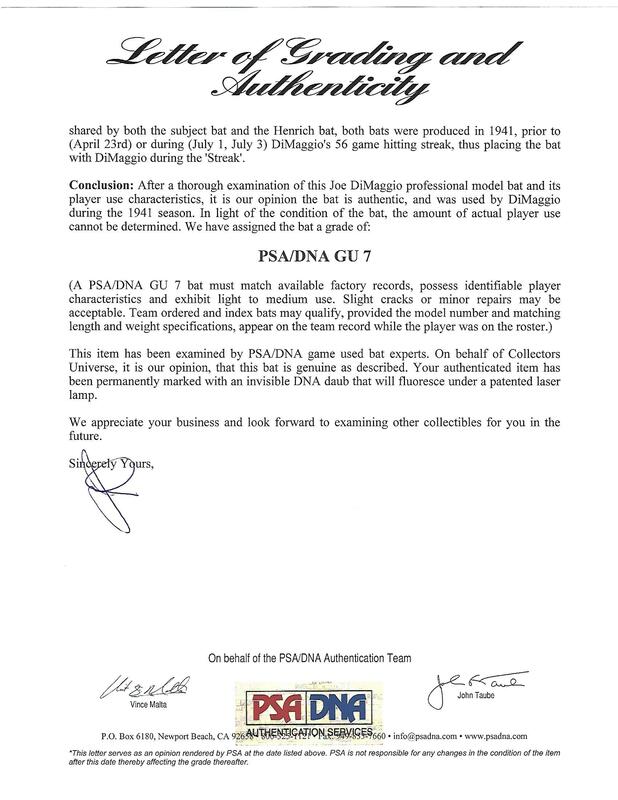 LOA from John Taube of PSA/DNA with GU 7 grade. 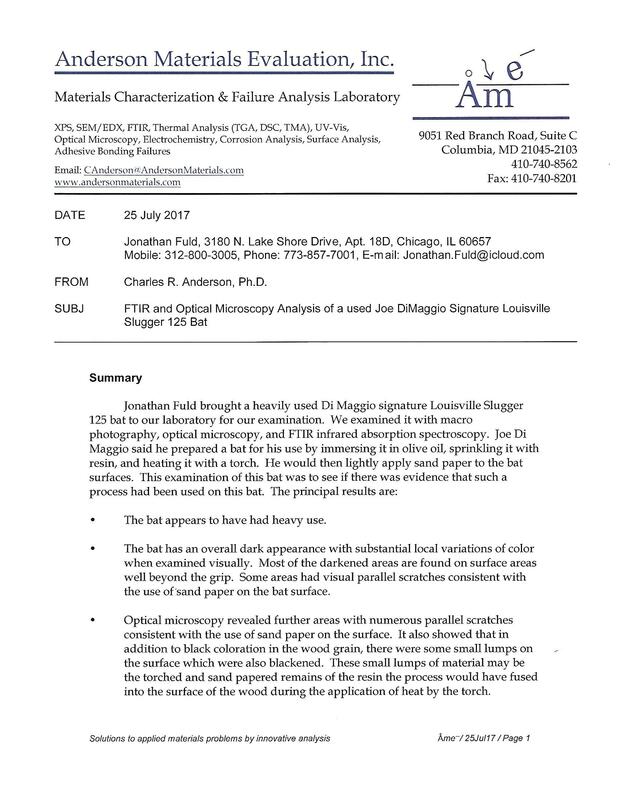 Includes 21-page report from Anderson Materials Evaluation, Inc., which evaluated the bat via FTIR and optical microscopy analysis. 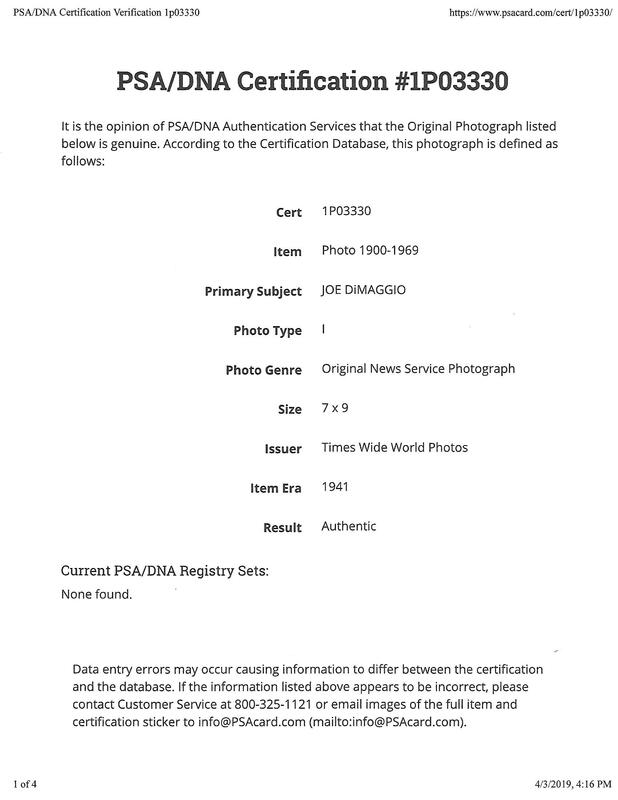 Also comes with a 7/17/41 wire photo (PSA/DNA Type I - 1P03330) from the day the streak ended showing DiMaggio making a goose egg gesture with his hands after going hitless (World Wide Photos caption on back). In the picture, he's holding a similar looking bat.